Then there’s programmatic search advertising. Generally, when a business says they want to advertise on Google, they’re saying they want to do search advertising – showing their ad when someone searches for a term or phrase on Google. But there are lots of other search bars on the web, on lots of different types of websites. For simplicity’s sake, let's call a search done at Google (or Bing or Yahoo or DuckDuckGo) a primary search. You use a primary search engine to find a destination. Once you’re there, however, you may need to do more searching by using the search bar on the site – that’s a secondary search. A good example is WebMD. If you search your symptoms on Google (the primary search), it might lead you to WebMD, where you might do another search for curing your symptoms (the secondary search). Advertising with primary search engines can get expensive, quickly, because your competitors are also using those primary search engines and are bidding on many of the same terms. Programmatic search advertising lets you reach people that may be looking for you in several ways. The first is through secondary search – when someone is searching within a site, the programmatic ad system can see that and advertise to that person based on what they searched for. The other way programmatic search works is through contextual matching – or, in laymen’s terms, is the person reading about “stuff” a good candidate for you to reach via an advertisement? Contextual search advertising is like saying, “I want to reach college basketball fans, so I’ll advertise in the Sports Illustrated college basketball issue” – but a lot less expensive. 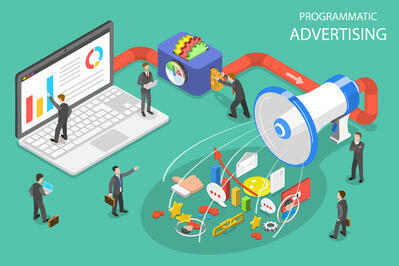 Which brings us to WHY programmatic ads are something a locally focused or small business should learn about – they’re inexpensive to create and run consistently. Let's say you run a roofing business. Your cost per click for an ad on Google may be $8.00 to $10.00 depending on your area and the competition. If you spend $500 a month with Google, you’re getting 50-60 clicks on your ad, and only some will convert to someone you can speak with. That same budget with programmatic advertising will put 50,000 ads with your name in front of people. You’ll get the same 50-60 clicks but your ad, and your brand, is shown without being crowded in a list with your competitors. We know this stuff is complicated, and if you don’t deal with digital advertising every day, it seems too difficult to learn and easier to just skip – but don’t. Your potential customers are leaving digital breadcrumbs of what they’re interested in, and programmatic advertising helps you follow the trail and land new business. Call us and let’s talk it through. You don’t need to understand how it works – you only need to know what it can do for you.